This week was a sad week for those of us who grew up with movies like: That Darn Cat, Blackbeard’s Ghost, or The Love Bug. Actor, and Disney Legend, Dean Jones passed away at the age of 84 from complications related to Parkinson’s Disease. He was hand-picked by Walt Disney to come aboard and become an actor for Disney Studios. I remember how much I enjoyed seeing him in each Disney film he was a part of. And, I especially remember his role as Jim Douglas in Disney’s The Love Bug. He appeared with Buddy Hackett, Michelle Lee, and of course Herbie, The Love Bug himself. It was a fun movie with plenty of comedy and drama, and a clear message of right versus wrong. The most important thing about Dean Jones, to me, was his faith. He took roles in things like; The Visual Bible: Acts in which he played Luke, one of Jesus’ Disciples. And, he played Abraham in a video entitled God Provides. He was serious about his faith and he worked to find roles that had positive messages and would leave a legacy that his children and grandchildren would be proud to watch over and over. Thank you, Dean Jones, for bringing us all many years of enjoyment and happiness! Author threestrandswdwPosted on 09/05/2015 Categories Disney MoviesTags Dean Jones, Disney Legend, The Love BugLeave a comment on Disney Legend…gone! Is it true? How can this happen? I can’t believe it! As you may have heard, the American Idol Experience is closing on August 31, 2014! It had been slated to originally close sometime after the holiday season, but that has changed. And, while there has been no “official” word from Disney as to what will be replacing this attraction, there have been a few rumors flying around. Let’s take a look at a few of those, and see if we can maybe come up with some other ideas of our own, shall we? The first rumor comes as no great surprise to anyone. Star Wars! However, it seems that anything having to do with more Star Wars in the parks may be more than a few years away. It does, however, make perfect sense given the somewhat close proximity to Star Wars: The Adventure Continues attraction! Rumor number two seems to have a bit more rubber on the road. The Frozen Sing-Along may possibly be moving into this venue. And, with the popularity of Frozen around the world, it makes sense to move IF it is a larger theater with a much larger capacity. Or, if it can move more people in a shorter amount of time. I only hope that Disney takes a little time to really make this theater shine inside and out! Let’s face it, Frozen is HUGE! And, I believe it has some longevity to it! Enough to sink a little time, money, and effort into making this a show worthy of any attraction at Walt Disney World. So, what do you think, friends? Are there ideas that haven’t been considered? Tell us what they are! Share with everyone by sharing in the comments below! Until next time, have a Blessed and Magical Day!! 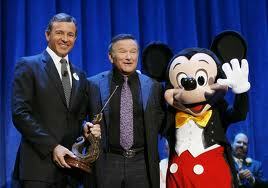 In 2009, he was inducted into the Disney Hall of Fame as a Disney Legend! He was the Genie in Aladdin! And, he made many hearts a little lighter with his special brand of comedic talent! Robin Williams died on August 11, 2014. I’m not going to spend time on the details of his death! Instead, I want to take a moment and look at his impact on the Walt Disney Company! Many of his movies were produced under a production company under the Disney banner, and he also voiced a few very popular attractions at Walt Disney World, and Disneyland. He was the voice of The Timekeeper attraction, and was partnered up with CBS News icon Walter Cronkite in Back To Neverland at Disney’s Hollywood Studios, and Disney’s California Adventure. You can see a video of this on YouTube! Some of the other titles include: Good Morning Vietnam, Dead Poet’s Society, Mrs. Doubtfire, Flubber, and Old Dogs! I just wanted to go on record as stating, that the Disney Classic “Pollyanna” is still an excellent movie! As I sit here with my two daughters, I noticed that they are completely engrossed in the story. And, though my oldest began comparing it to the book, she has settled in and is now following along! If you haven’t exposed your children to this, or any other Disney Classics, may I suggest that you consider adding them to your library, or borrow them from your Public library! Have a Blessed and Magical Day!! So, I know that I am really late with this, but I had a Walt Disney World vacation, Christmas, and a few other things pop up in my life. 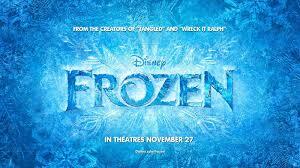 I was finally able to take the threestrandswdw kids, including my 15 year old son, to see “Frozen” at the theater! This movie is quite worth watching with the entire family! The animation is spotless and the soundtrack if fabulous! I know the teasers that were released early in 2013 didn’t look very enticing. I am happy to report that this film blows away any competition for the foreseeable future. I don’t know if it will get any Oscar nods, but it should! Without giving anything away, the story is about two sisters. One has a ‘gift’. The other does not! In the end it is the sister’s love for each other that pulls the story to an exciting and touching conclusion. Don’t get out of your seat for even a minute of this movie as it moves pretty quickly. I give “Frozen” a popcorn rating of four bags!! See it in the theater to get to full impact of the striking colors and awesome music!